WHRDs face a variety of risks and violations in their work. The WHRDIC report: Our Right To Safety (PDF 1MB ) is an effort to assess the various mechanisms that have been developed to provide protection to WHRDs at risk, including initiatives developed by national governments, and regional and international human rights bodies. 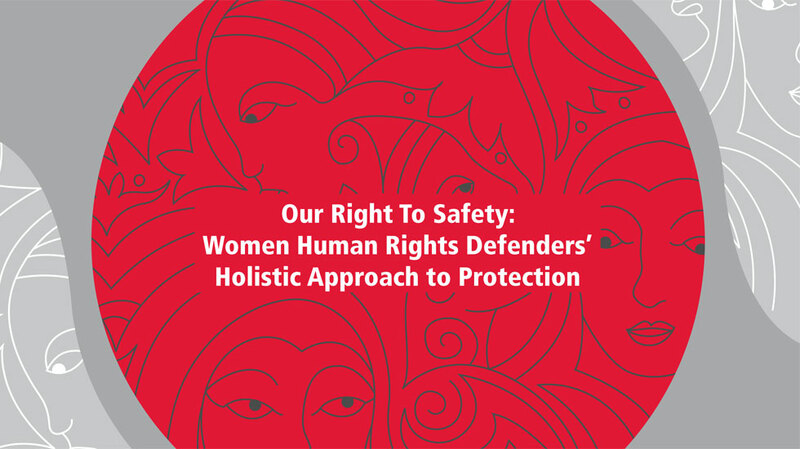 Read the report Our Right To Safety: Women Human Rights Defenders’ Holistic Approach To Protection PDF version (1MB)or online. Another defender interviewed for the research also explained that when they were negotiating with the government to cover certain expenses related to education and health under the protection measure, the government responded that the goal of their protection measures was not to eradicate poverty. These examples—as well as the many others that are included in the publication—help illustrate the complex situations that WHRDs face when they are threatened with violence because of their work. It is this complexity that this new publication seeks to address. The variety of risks and violations that WHRDs face requires the adoption of differential support programs and gender-specific protection measures, taking into account the contexts in which women defenders live and work as well as other conditions and identities present in the diversity of WHRDs. The WHRDIC has developed this publication in an effort to assess the various mechanisms that have been developed to provide protection to WHRDs at risk, including initiatives developed by national governments, and regional and international human rights bodies. Do protection schemes take into account the unequal economic conditions that WHRDs face in most societies and how this increases their vulnerability and their ability to confront risk? Do they take into account the responsibility that many WHRDs have as the primary or sole caregiver in their families? Do protection measures move beyond physical protection and provide psychosocial support and access to other necessary health services? These are some of the questions that we have explored in this publication, and which have helped us develop a more profound understanding of the meaning of gender-sensitive protection measures and the unique security concerns confronting WHRDs. In responding to these questions, WHRDs have emphasized the need to advance an integrated concept of security that takes into account the historical, cultural, political and social contexts in which they live. That is—a concept of protection that takes into account how WHRDs experience human rights violations differently because of their gender and other economic, social, and cultural factors. Interview with Valentina Rosendo Cantú and Centro de Tlachinollan, Mexico.